Ann Shrager art work is inspired by her travels. Recently images of India feature predominantly in her contemporary paintings. She successfully captures the beauty and elegance of the country and its people in oil paintings that have a dreamlike quality to them. 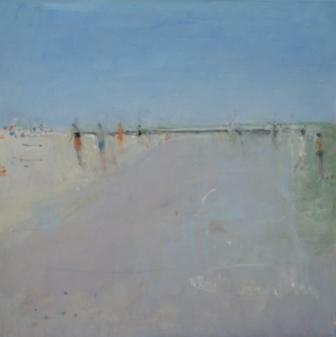 ''The Beach'' gives us a warm and hazy impression of a beach. Ann Shrager uses subdued tones to create the atmosphere in this modern art piece.